At times, we get so caught up in the earth…we forget the ocean and its magic from whence we came. Another of Odin’s sons was Hermod, his special attendant, a bright and beautiful young god, who was gifted with great rapidity of motion and was therefore designated as the swift or nimble god. On account of this important attribute Hermod was usually employed by the gods as messenger, and at a mere sign from Odin he was always ready to speed to any part of creation. As a special mark of favour, Allfather gave him a magnificent corselet and helmet, which he often donned when he prepared to take part in war, and sometimes Odin entrusted to his care the precious spear Gungnir, bidding him cast it over the heads of combatants about to engage in battle, that their ardour might be kindled into murderous fury. Hermod delighted in battle, and was often called “the valiant in battle,” and confounded with the god of the universe, Irmin. It is said that he sometimes accompanied the Valkyrie on their ride to earth, and frequently escorted the warriors to Valhalla, wherefore he was considered the leader of the heroic dead. Hermod’s distinctive attribute, besides his corselet and helm, was a wand or staff called Gambantein, the emblem of his office, which he carried with him wherever he went. Once, oppressed by shadowy fears for the future, and unable to obtain from the Norns satisfactory answers to his questions, Odin bade Hermod don his armour and saddle Sleipnir, which he alone, besides Odin, was allowed to ride, and hasten off to the land of the Finns. This people, who lived in the frozen regions of the pole, besides being able to call up the cold storms which swept down from the North, bringing much ice and snow in their train, were supposed to have great occult powers. 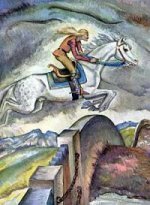 The most noted of these Finnish magicians was Rossthiof (the horse thief) who was wont to entice travellers into his realm by magic arts, that he might rob and slay them; and he had power to predict the future, although he was always very reluctant to do so. Hermod, “the swift,” rode rapidly northward, with directions to seek this Finn, and instead of his own wand, he carried Odin’s runic staff, which Allfather had given him for the purpose of dispelling any obstacles that Rossthiof might conjure up to hinder his advance. In spite, therefore, of phantom-like monsters and of invisible snares and pitfalls, Hermod was enabled safely to reach the magician’s abode, and upon the giant attacking him, he was able to master him with ease, and he bound him hand and foot, declaring that he would not set him free until he promised to reveal all that he wished to know. Rossthiof, seeing that there was no hope of escape, pledged himself to do as his captor wished, and upon being set at liberty, he began forthwith to mutter incantations, at the mere sound of which the sun hid behind the clouds, the earth trembled and quivered, and the storm winds howled like a pack of hungry wolves. Pointing to the horizon, the magician bade Hermod look, and the swift god saw in the distance a great stream of blood reddening the ground. While he gazed wonderingly at this stream, a beautiful woman suddenly appeared, and a moment later a little boy stood beside her. To the god’s amazement, this child grew with such marvellous rapidity that he soon attained his full growth, and Hermod further noticed that he fiercely brandished a bow and arrows. Rossthiof now began to explain the omens which his art had conjured up, and he declared that the stream of blood portended the murder of one of Odin’s sons, but that if the father of the gods should woo and win Rinda, in the land of the Ruthenes (Russia), she would bear him a son who would attain his full growth in a few hours and would avenge his brother’s death. Hermod listened attentively to the words of Rossthiof and upon his return to Asgard he reported all he had seen and heard to Odin, whose fears were confirmed and who thus definitely ascertained that he was doomed to lose a son by violent death. He consoled himself, however, with the thought that another of his descendants would avenge the crime and thereby obtain the satisfaction which a true Northman ever required. Gunnlaug Worm-Tongue was, as is aforesaid, whiles at Burg with Thorstein, whiles with his father Illugi at Gilsbank, three winters together, and was by now eighteen winters old; and father and son were now much more of a mind. There was a man called Thorkel the Black; he was a house-carle of Illugi, and near akin to him, and had been brought up in his house. To him fell an heritage north at As, in Water-dale, and he prayed Gunnlaug to go with him thither. This he did, and so they rode, the two together, to As. There they got the fee; it was given up to them by those who had the keeping of it, mostly because of Gunnlaug’s furtherance. But as they rode from the north they guested at Grimstongue, at a rich bonder’s who dwelt there; but in the morning a herdsman took Gunnlaug’s horse, and it had sweated much by then he got it back. Then Gunnlaug smote the herdsman, and stunned him; but the bonder would in nowise bear this, and claimed boot therefor. Gunnlaug offered to pay him one mark. The bonder thought it too little. This gift shalt thou make shift with. So the peace was made as Gunnlaug bade, and in such wise the two rode south. Now, a little while after, Gunnlaug asked his father a second time for goods for going abroad. So Illugi rode hastily from home, and bought for Gunnlaug half a ship which lay in Gufaros, from Audun Festargram—this Audun was he who would not flit abroad the sons of Oswif the Wise, after the slaying of Kiartan Olafson, as is told in the story of the Laxdalemen, which thing though betid later than this.—And when Illugi came home, Gunnlaug thanked him well. Thorkel the Black betook himself to seafaring with Gunnlaug, and their wares were brought to the ship; but Gunnlaug was at Burg while they made her ready, and found more cheer in talk with Helga than in toiling with chapmen. Now one day Thorstein asked Gunnlaug if he would ride to his horses with him up to Long-water-dale. Gunnlaug said he would. So they ride both together till they come to the mountain-dairies of Thorstein, called Thorgils-stead. There were stud-horses of Thorstein, four of them together, all red of hue. There was one horse very goodly, but little tried: this horse Thorstein offered to give to Gunnlaug. He said he was in no need of horses, as he was going away from the country; and so they ride to other stud-horses. There was a grey horse with four mares, and he was the best of horses in Burgfirth. said Thorstein; and therewithal got on other talk. And now they ride homewards down along Long-water. Now in the evening they come home; but next morning Gunnlaug rode up to Gilsbank, and prayed his father to ride with him a-wooing out to Burg. says Thorstein; and so they did, and Gunnlaug went with them. Thereat they parted; Illugi rode home, but Gunnlaug rode to his ship. But when they had wind at will they sailed for the main, and made the northern part of Norway, and sailed landward along Thrandheim to Nidaros; there they rode in the harbour, and unshipped their goods.